A 102-year old Australian woman became the world’s oldest skydiver, while also making people aware of the disease that killed her daughter. Irene O’Shea, living in Athelstone, Australia, was born on May 30, 1916 and turned 102 years and 193 days old, when she jumped from more than 14,000 feet on December 9. She broke the world record by being 1 year and 155 days older than the former record holder Bryson William Verdun Hayes who jumped out of a plane in May 2017 at the age of 101 years and 38 days. 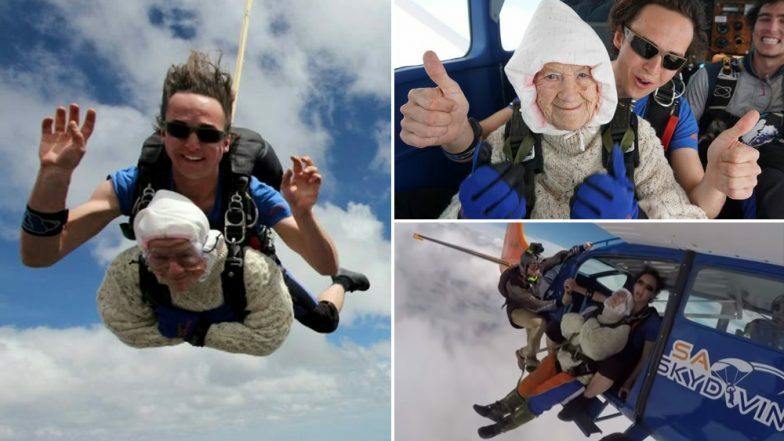 Mrs. O’Shea made it a tradition to leap out of a plane once a year beginning on her 100th birthday, when she went on her first skydive and hopes she lives long enough to jump at the age of 105. During her jump she was supported by the company SA Skydive, that takes her on her daring leaps since she started in 2016, and a big group of friends and family. This included almost all of her 5 grandchildren, her 11 great grandchildren and Mike FitzHenry, her son-in-law. Mr. FitzHenry is the husband of Mrs. O’Shea’s daughter, who died years ago due to Motor Neurone disease. With her jump, the centenarian wanted to raise awareness and money for MND, together with the Motor Neurone Disease Association of South Australia. You can donate on her gofundme page or the official MNDSA website below and help Irene O’Shea with reaching her goal of raising $10,000.